Core vocabulary is an evidenced-based set of words particularly useful for augmentative and alternative communication (AAC) users. I’ve personally seen huge growth in expressive language skills of AAC users after only a few therapy sessions of instruction with core words. Core words are what make up 80% of our everyday utterances. The power of core words lies within how versatile just one word can be in a variety of contexts. However, finding new and different ways to teach the use of core vocabulary is sometimes daunting. Here are some of the ways I’ve found success in teaching and encouraging carryover of five of my favorite core words. I’ll help you go beyond using “want“. In my opinion, “put” is one of the most valuable, under-utilized core words – especially for the younger population! I work with preschoolers and at that age they love being “busy”. Moving toys from one place to another, dumping containers, etc. 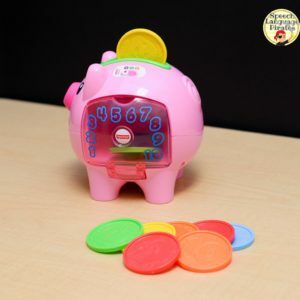 piggy bank: Fisher Price makes this toy and my kids LOVE it! 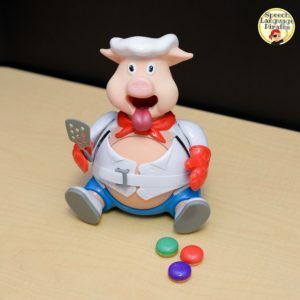 It makes adorable noises every time you “put” a coin in the pig’s slot. It’s also very easy to occlude both the slot and the door from opening with one hand, in order to sabotage the situation and “force” a student to use his/her words! “Put” the money into the pig. 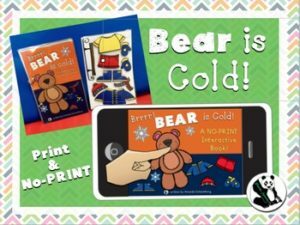 I’ve been using this book all winter long and the kids don’t ever get bored of “put”-ing the clothes on the bear. Each article of clothing he wears is another trial to tell you that she wants to “put” the item on the bear. Click the picture below to have a closer look at this interactive book! 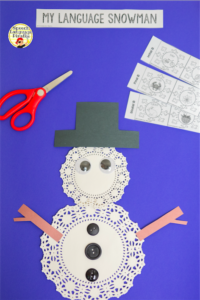 You can also use a “weather bear” or “weather frog” bulletin board set or even a doll. crafts: “put” glue on the paper, “put” the shape onto the picture, “put” the glitter on, “put” the craft on the wall when it’s finished. Every step of a craft you’re putting something somewhere. Take advantage and get lots of trials! 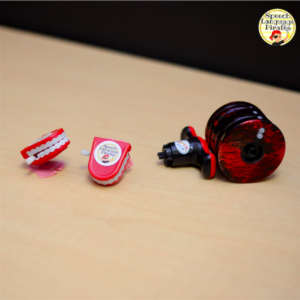 spinning top: This spinning top is perhaps my absolute favorite therapy toy. All ages love it and few ages can actually work it independently 😉 Children must request that it “go” and describe that it “STOPped”. 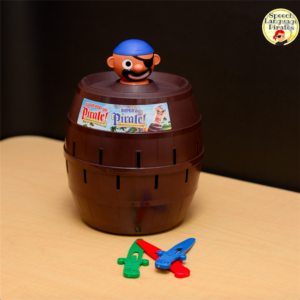 wind-up toys: The same appeal of the spinning top is true for wind-up toys. cars: Use any type of vehicle on any type of surface: road rugs, ramps, the floor, etc. taking turns: Every game that involves turn-taking is an opportunity to model or require the word “go”. CD player/youtube videos: Does your student have a favorite song or show? Play it on your iPad randomly, but keep it out of sight and wait for his/her eyes to light up. Model “hear” and then show the video! Stop it and wait for the student to request to “hear” music again! outside stimuli: I realized this when the classroom that adjoins mine had a music presentation that involved a bass. When that instrument bellows next door, even the grumpiest students perk up! You can also talk about hearing familiar people in the hall – maybe his/her teacher or friend happens to be walking by. Take advantage of the teachable moment that would have otherwise been a disturbance! spinning top: The beauty of a spinning top is that most students can’t get it to work on their own. They need your assistance! In order to get the top to spin, you put the handle in it, then “turn” it! The student must tell you to do so. I usually give my top three turns, so that’s three trials of the word! wind-up toys: The same is true for wind-up toys. Some children need your assistance to turn the handle in order to make it go. Saying they “want” the toy is great. Give it to them. Then, when they can’t work it and hand it back to you, they must request that you “turn” the handle for them. taking turns: Any game where you take turns, including the ones listed above, can also be used to elicit “turn”, as in “my turn”. 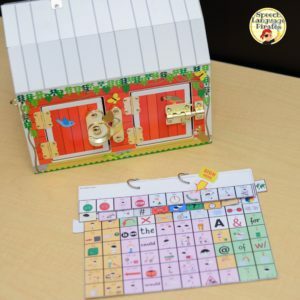 latches: I use this Melissa and Doug barn, however, you could use anything similar that has latches that turn. This, again, is a rather difficult door to open for little hands, therefore requiring adult assistance. *Another tip for focusing on a core word is to use a sticky flag, like the one pictures above. It’s a visual cue for where to point, rather than your own finger. You can also use fun Washi tape , bright duct tape, or even painter’s tape to surround and highlight the word(s) you’re targeting. 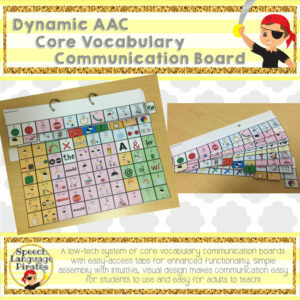 You can find the core vocabulary board pictured above here or click the photo below. Phrase options: “no ball”, “yes ball”, “no open”, “yes open”. I hope these tricks will give you some fresh therapy ideas to use with your AAC users or even those who are verbal. Thanks for reading! Great ideas! I use most of these items and the kids stay focused on them. I’m glad you took time to share them, thank you! 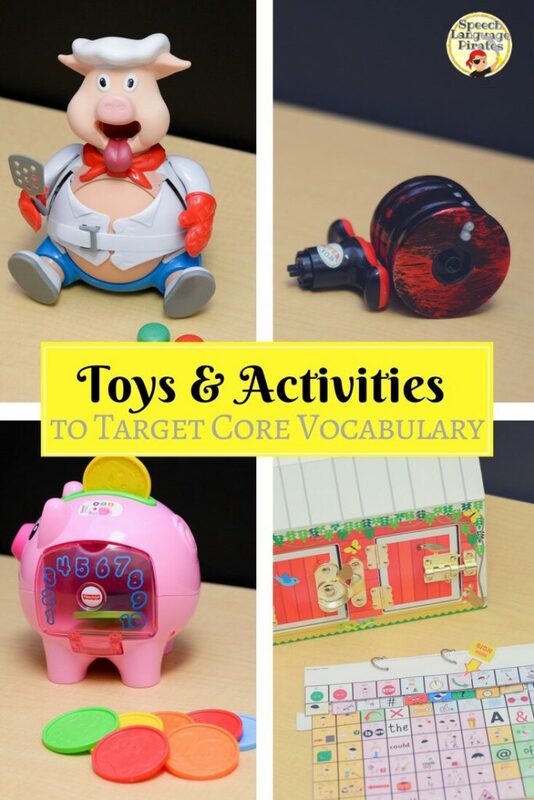 I tried to find toys that most SLPs already own and just give ideas on how to use with core vocabulary 🙂 Thanks for reading! Great ideas! Thanks for sharing! 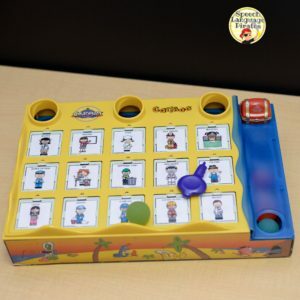 Just what I needed for my AAC and autistic students! By the way.. I inherited the pig toy as I’m in a new classroom, but don’t know how to work it. Does it take batteries? If so what size. No batteries needed! You feed it the hamburgers and push its head based on the number on the bottom of the burger. After her pops,make it skinny again by pushing his head again! This had some new ideas. Really appreciate for taking the time to share it! 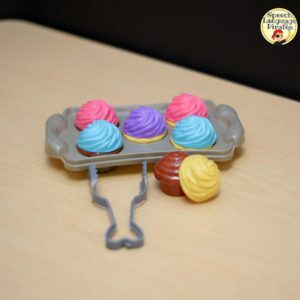 I’m from Sri Lanka and I would like to know whether I can purchase the wind-up toys from amazon? This is a great post! 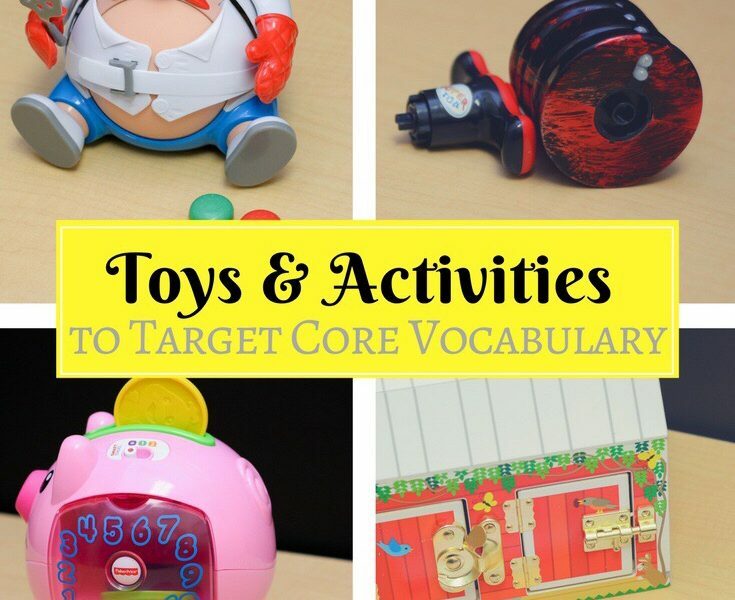 As someone who works with many AAC users who learn best through play and interactive books, it is refreshing to see a post that provides such a great list of activities and potential target words. This would also be a great resource for CFYs or SLPs who are currently in grad school. That is so sweet of you to say – thank you so much! I’m so glad you like it and found it a worthwhile read. This was SUCH a great post. I’m so happy I stumbled upon it! This is my first year working with students who need AAC, and this really helped me think of ways to keep therapy interesting but incorporate some core vocab! 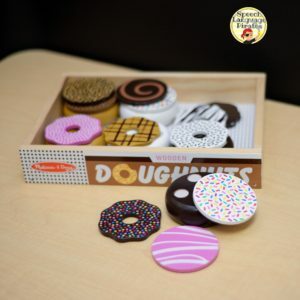 Wonderful ideas for some toys that I already own! Now… how do you get your teaching staff on board? That can certainly be trying. I’ve found that inviting the teacher in to a therapy session to “see how well the child is doing!” (but really to also model your own modeling!) is helpful. Wow these are great ideas and ways engage in authentic communication while having fun. Thank you so much for taking the time to share. I’m a visual person and would love to see some videos if possible. Do you have any or can recommend any?